This Sunday is the big NFC championship game where the 49ers are traveling to Seattle to face the Seahawks. But the more troubling issue is why Muni is not allowing any trolleybuses to run in the city, and instead substituting it for diesels all Sunday. From the Chronicle, the reason why the trolleybuses are being locked in the garage is a precaution in case there's fans rioting in the streets. Riots? If citizens wants to riot, they'll vandalize or destroy any Muni bus they please, regardless if it is diesel or electric. The truth of the matter is, if Muni takes all the electric trolleybuses off the streets on Sunday, you will experience severe delays on all trolleybus lines. There are not enough diesel buses to make-up for a huge loss. And how do I know of the delays? Last week Saturday, Muni switched all electric lines running along Market street to diesel only (excluding the 14-Mission), but they had a legitimate excuse, there was major road construction on Market and it blocked the overhead wires and the tracks used by the F-Market. I ride the 6-Parnassus, but the diesel buses ran too far apart, with wait times of 30 to 40 minutes; normally the wait with trolleybuses is about 15-20 minutes. Even the bus substitution for the F-Market was terrible, I was waiting 25 minutes for a bus that was sardine packed; after that point, I turned around and went home. But wait, there's more. This Sunday, Muni is cutting-off all Cable Car and F-Market service and they are also going on diesel as well. For the entire three day weekend, the N-Judah will not run trains from Duboce and Church to Ocean Beach, and instead run much slower and smaller capacity buses. This means that all the diesel lines will be STRETCHED THIN. 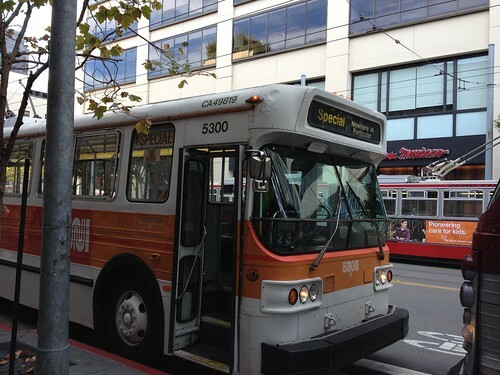 I seriously question the SFMTA's choices of cutting-off all the trolleybus lines for diesels. Like I said earlier, with all the lines being forced to diesels, there is not enough diesel buses to make-up a huge gap like this.